Think youre ready for the Melt? Read this! In less than two weeks, most of us will be packing our coolers and sleeping bags for what will be the largest Zooki-Melt in its history. Just as many of us will be catching up with old friends and trail rivals, there will be many new faces as well rookies looking for a bit of experience, or maybe an old-timer is bringing a new friend to join the ranks. Whatever the reason, its great to see everyone getting along and having a good time and enjoying the company of each other. 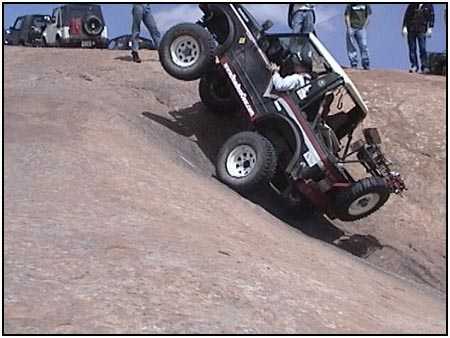 Oh, and doing a little wheeling as well. By popular request, Ive decided to put together an article preparing not only the first timers but also some of our repeat visitors not about what to expect, but more what is expected of you, fellow Zooker. First of all, I strongly recommend that you visit the Zooki-Melt info pages, if nothing else for directions to our new HQ, Steam Corners Campground. Theres also a list of rules and regulations which will be good to know. Spend some time now to read them so you wont be disappointed later. Anything you pack should be strapped down securely even on the blue trail, toolboxes can pop open and coolers will bounce into the mud. Many people have contributed what they feel are the golden rules of running the trails. Some were worded so well in their emails that I just took them verbatim thank you for the contributions, by the way. The entries break down into two overlapping categories: Trail Etiquette and Attitude. Heres everything in no particular order. Trail Etiquette Breakage is part of the game. It will happen, and it probably will happen to you. Maybe youll break a mirror off, or scratch the paint. 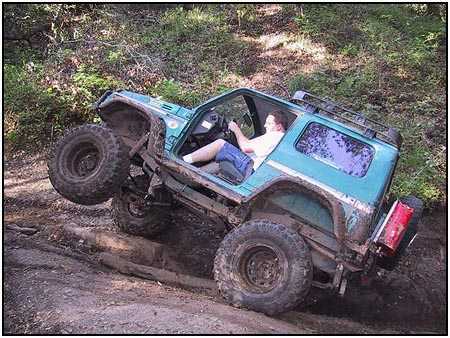 Maybe youll break a drive shaft. Be cool. It can be fixed. Dont freak out about something small. Just get the rig off to the side so that others can get past and then investigate the situation, usually others will pitch in and try to get you moving again as quickly as possible. On that same token, if you see everyone out of their rigs standing around anothers truck which is stuck, broken, or whatever... Maybe this is a cue that you too should be out in the sun offering to help? Turn off the stereo. If you must have music, set the volume so that you can just hear it inside your cab. The trails are not the place for your thumper bass system that makes our rigs shake. Many of us go out there to escape the noises of the city and wish to hear our motors singing and the tires crushing over twigs. Trail Music. Dont forget needing to hear spotters, CB communication, and your own judgment. Exception: playing Ride of the Valkyries as you strain up a hill steeper than youve never done before is encouraged. Every rig has its own theme song just remember that everyone else might not care to hear it. Speaking of broadcasting: The CB. Remember that you never know who may be listening so please watch your language, and dont talk just because you have a microphone. The CB is great for communicating anything, but we dread the day there is an emergency and no one knows it because someone was singing along with their radio again. Keep the coms short and sweet. On the other hand, DO use your CB to help others along. 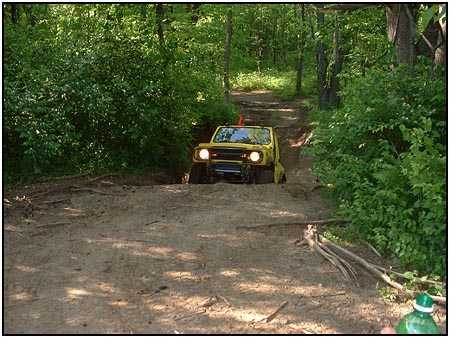 Radio ahead a clear when you have completed a blind obstacle and you feel it is safe for the next driver to pass. Also, wait for the clear before attempting said hill. Dont Tailgate! 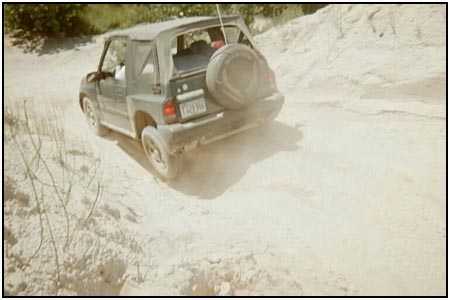 A friend wrote in, Last year was my first time in real trails and some wingnut was up on my back bumper the whole trail! It didn't matter where I was or what I was doing, he was always coming down before I could give the all clear on the CB. He was making me very nervous and angry it really took away from the experience. I have to agree its no fun trying to negotiate a tricky hill and enjoying the ride without worrying if youre going to be rear-ended. By the way, uphill has right of way. When choosing your trails, dont be pushed into doing an obstacle you dont feel comfortable tackling. Stop and think: Be Gallant and not Goofus. Watch some more experienced people and listen to the spotters as they direct the other trucks and learn from the others. You will not be left behind, and you will not be ridiculed for your honesty and good judgment. If nothing else we may just show you another way to do it. When running a trail, keep tabs on those following you dont leave without them! You are their lifeline to the trail leader. There is nothing worse than being stuck and realizing the person in front of you has moved on and left you there. Good communication between the leader and tailgunner eliminates most of these problems. If something does happen, and you end up separated from the group, dont panic. Youre not going to be stranded for days on end. Chances are youll see another group coming soon, or at least hear them. If nobody else is around, be sure to fabricate a story about a bear chasing you and share it with us at the campfire later. Regarding Spotters: One spotter per truck or obstacle, driver has the final say who to listen to. For some reason people think that its easier to listen to ten people saying different things than it is to listen to the one they have chosen. If youre not the appointed spotter, keep quiet! Of course, if you are asked to help, or you see an emergency that the others cant see from their angle, there are exceptions. If you find yourself in the situation with too many spotters trying to help, simply stop and tell them to please keep it down; you cannot hear your spotter. Besides, I know a lot of people (myself included) like to try to figure things out on their own first, and not have a spotter until asked, otherwise it has that distracting Hey batta batta sa-wing batta effect. If I'm puttering along on what is to me an easy obstacle, I find it somewhere between annoying and insulting to have someone walking along side me telling me what to do when I already know -- almost like someone looking over my shoulder here in the office. Just ask first. Do you need a spotter? Also remember that bad spotting can ruin a nice video scene. 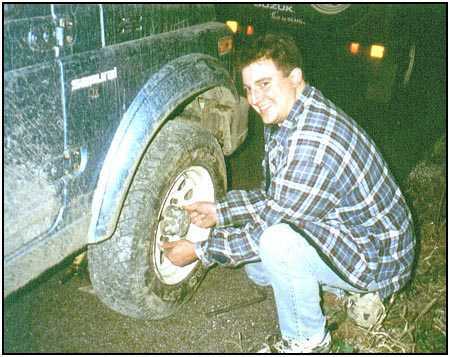 Like was said before, the music of the truck is the best soundtrack: the grinding of gears, rubber grabbing on the rocks and valves floating... thats part of the experience that I want to remember. I cant remember who it was but while watching a friends video I saw a clip featuring someone standing right next to the cameraman shrieking out "look out for that branch.. look out for that rock... another rock... no, to the left..." Really ruined the effect on playback. Be courteous to others. ATTITUDE One word: attitude. Spudzuki from the Off-Road.com BBS had these words to live by: Even if you have been wheeling for over twenty years like me, you are a rookie if you haven't run the particular trail recently/ever. Accept the fact that you may be one hell of a wheeler with one of the best rigs ever built, but without recent experience on this trail you are a (seasoned) rookie. Talk to your fellow drivers before you start, get a feel for who they are and what their knowledge and experience is like. Personally, I always like to find someone that has a rig that is roughly equivalent to mine, is knowledgeable of the trail and not driving with a "Let's see how much damage I can do to my rig this time!" attitude and try to stick with them. Listen to the spotters, listen to the folks who have run this particular trail recently, listen to everyone except for the ones that everyone else is ignoring (they most likely have a really good reason to). Follow the pack, take the path/line that the people who have done it a lot before use. 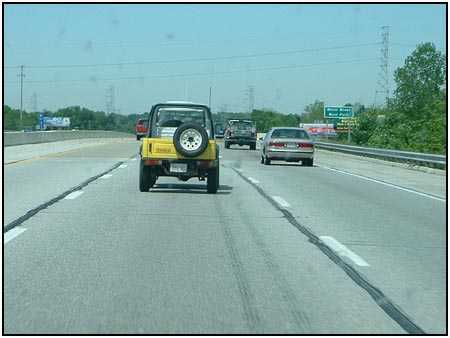 Don't follow the driver that takes the line that makes everyone else cringe, laugh or shake their heads. Finally, we are all out to have fun. Enjoy what you are doing and do what you enjoy. If it's too much for you, swallow your pride and take a bypass or a winch or whatever. This should go without saying, but if you happen to run into a new crowd you havent met before, dont run over and start bad mouthing their rigs just because you don't like that particular brand of whatever it is, or it's not as nice or as built up as yours. 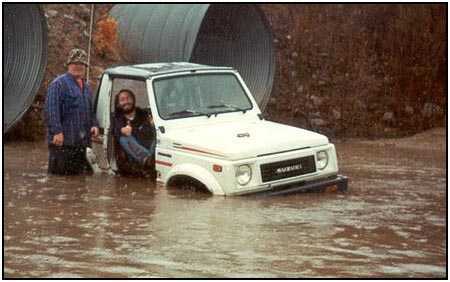 We're all in this together no matter what we drive! Were all out there to have fun. Id like to close the article with an email sent by one of the guys who inspired me to be a Seasoned Rookie. 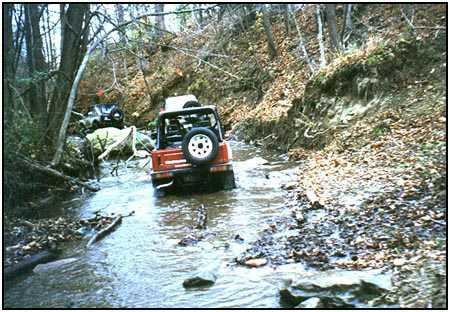 The very first time on the trails I had my little blue stocker (the same one I drive today) I was cold, frustrated, wet, and miserable. This guy kept me going and kept cheering me on like I was already among the ranks; little did I know that I already was. Amen, brother Bill. And remember everyone, youre a rookie because youre trying something new. A seasoned rookie is someone who comes back to try again!See you at the melt!